Darjeeling is beautiful!!! I already feel like I need to come back here to do some hiking. The crew I’m with right now is not exactly the hiking type, so I don’t think we’ll be uncovering any hidden gems of Darjeeling while we’re here. Anyone out there want to come and trek across northern India with me? The train at Ghum Station. It’s interesting to see how the British have left a legacy in the most random of places… if you’ve ever been to London, that station sign should look familiar. It’s the same symbol as is used for the tube. We took the Darjeeling Himalayan Railway (also called the “Toy Train”) from Sonada to Darjeeling (elevation = 6,700 feet). Its tracks are only 2’ apart, so obviously, it’s much smaller than normal trains. It’s also a UNESCO World Heritage Site and has been running since 1881. It’s kind of amazing to see how the tracks wind their way through the mountains, and they’re 48 miles long! I mean, that’s not that impressive if we’re just talking about regular train tracks, but add in the mountains, and I think it’s pretty remarkable. After probably an hour on the train (it doesn’t go very fast, plus it made some stops along the way), we arrived at Darjeeling Station. The views for the entire ride were great, and at the station, we got another glimpse of some of the awesomeness that lay beyond (I say “a glimpse” because there were power lines galore blocking us from getting an unobstructed view). I personally am all about mountain views. I’ve seen a lot of them, but I don’t think they’ll ever get old for me. Plus, they’re all so different. The mountains in Peru were green and awesome, and these are also green and awesome, but they look NOTHING alike. Earth is the coolest. Ah, what a beautiful view! I’m so glad that there isn’t anything blocking it! The wildlife starts before you even get to the zoo. There are wild monkeys all over the place. Pastor Daniel talked to me about the monkeys soon after I got here and told me what to do if you’re even in a face off with one – don’t make eye contact and DON’T smile. It’s funny how, depending on where you grow up, you learn very different animal facts. Growing up, I learned about what to do around alligators and mountain lions. Here, the kids learn about what to do around monkeys and elephants. From there, we headed to the zoo. It’s a decent size, and it was interesting to see what animals they had because many of them are native to nearby areas. I also got to see my BFF, the snow leopard. It was just as magical as it always is. Pro tip though, the best place I’ve found to see snow leopards is the San Diego Zoo. You might have heard about how amazing that zoo is, and I’m telling you, people say that for a reason. The zoo is beautifully designed, it’s HUGE, they have multiple snow leopards, and you can get so close to them! Anna (the snow leopard) and I made eye contact and instantly became best friends. Sorry this is a huge aside, but seriously, you should go. Also, they have koalas. And Tasmanian devils. Anyway, as I was saying, this zoo wasn’t the best ever, but it was still cool. I felt like we were in the forest (because we were), and besides the snow leopards, they also had some red pandas which are adorable. As we were leaving, one of them climbed up into a tree that was probably 100’ tall (at least). It’s nice that they have the space to give them such a big habitat! Or maybe it escaped, who knows. I love you, snow leopard. One of the many super-cool walls at the zoo. Come for the animals, stay for the moss-covered walls. Weird bear sculpture-type thing in the bear enclosure. Some 100% safe electrical wiring at the zoo. Yes, at the zoo. Like in a public place where people and children visit. Yes, those splices are wrapped in electrical tape. Keep in mind that the voltage here is 240V, so a shock would be quite unpleasant. After the zoo, we spent some time wandering. We walked farther up the mountain, somehow managing not to get hit by a single car even though we were basically walking in the middle of the street. I frequently feel like I’m some sort of safety nut here because I’m like “hey, maybe we shouldn’t walk in the middle of the street” and everyone else is posing for selfies right in the path of oncoming traffic. I think I’m just being reasonable though, right? This makes me laugh. All of the bags of chips here are puffed out because they’re brought up from a lower altitude (so as the air pressure outside of the bag decreases coming up the mountain, the pressure inside stays the same and puffs the bag out). There’s another cultural difference you can add to the list. People here love selfies. Well, okay, maybe that’s not a cultural difference, but the love of selfies here is far beyond anything I have ever experienced before. Maybe I’m just not running in the right crowds at home. It’s not just selfies though, to be fair. It’s all pictures. People take SO MANY pictures, and most of the time, they’re of very underwhelming things. Like we’ll take a selfie in the middle of the street with nothing interesting in the background. Then we’ll take a selfie on the train. And next to the train. And sitting at the train station. And walking down the street. And and and and and… the list could go on forever. I’m more of a “take pictures for the memories, but also use your eyes and just enjoy the experience” kind of person, so I quickly grew weary of the constant picture-taking. Luckily, everyone’s phones except for mine were dead long before the end of the day. Life’s little blessings. By the time we finished our wandering and made it down the mountain, dark clouds were starting to roll in. Oh, rainy season, how I hate you. The rain comes frequently, quickly, and heavily. We snagged a bus back to Sonada before the worst of it started, thankfully. Oh, and we also ate more momos… yummm! I ate beef ones this time, so now, in two days, I’ve hit three different kinds. That’s pretty good, right? Beef momos! Not nearly as beautiful as the ones we made. This is very close to what my first attempt looked like, actually. 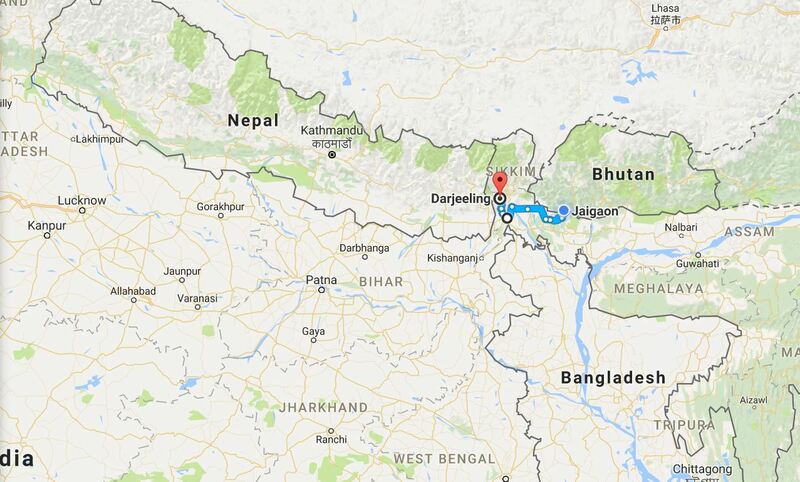 Just to give you a sense of where we are, Darjeeling is about 5 hours west of Jaigaon. For the next couple of days, Anisha, Neha, and I are staying with Anisha’s aunt and uncle. They live in Sonada, a town about 17 km away from Darjeeling. We’ll go into Darjeeling for tomorrow, but just getting to Sonada was enough of an adventure for one day! Us on the train with some of Anisha’s cousins. We left Jaigaon this morning at 5:00 to go to the train station which is about half an hour’s drive away in Hasimara. 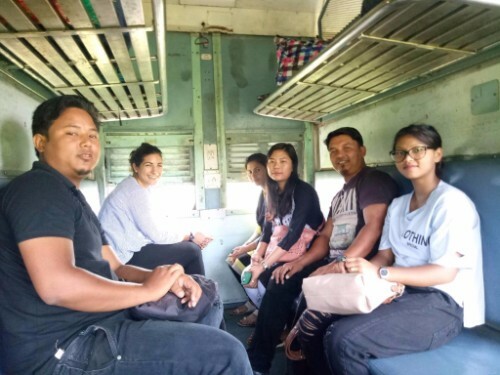 From there, we took the train to Siliguri. That took 3-4 hours, and from there, we still had a way to go. The train was MUCH different from the trains at home. There are usually different classes of train ticket that you can buy, but I don’t know that the train we were on even had a first-class-type car. We got our tickets (that cost about US$2) and sat in a car with bench seats, broken fans, and glass-less windows. The train is moving… and the train door is very open. One of the things that I CANNOT get used to is the way that people dispose of garbage in this country (and to be fair, it’s not just here). When I’m travelling and eat a snack or something, I put the wrapper in my bag until I can find a trash can. Here, you just throw it out the window. Anisha and Neha got some tea, and when they finished, out the window their cups went! Every time I see someone litter without a second thought (probably without even a first thought), it physically pains me. I want to just go and pick everything up! All of the trash cans here say “Use Me” on them, and at first, it’s kind of funny because you’re like, “Uhhh, why does the trash can have to tell you what to do?” Then, you realize that it really does need to be said, and it’s not quite as funny anymore. This isn’t the one we took, but it’s basically the same (besides the lack of chickens). When we finally got to Siliguri, we took a car the rest of the way to Sonada. It was basically the same concept as the mini-buses that I took in Ghana and Peru, but this was clearly made for the mountains. I’m not fully informed on car terminology, but I think it would be an SUV? I have no idea. It reminded me of an army vehicle or a hummer or something. Ugh, I don’t know. Just look at the picture. Ours also had caged chickens strapped to the top, so that’s fun. 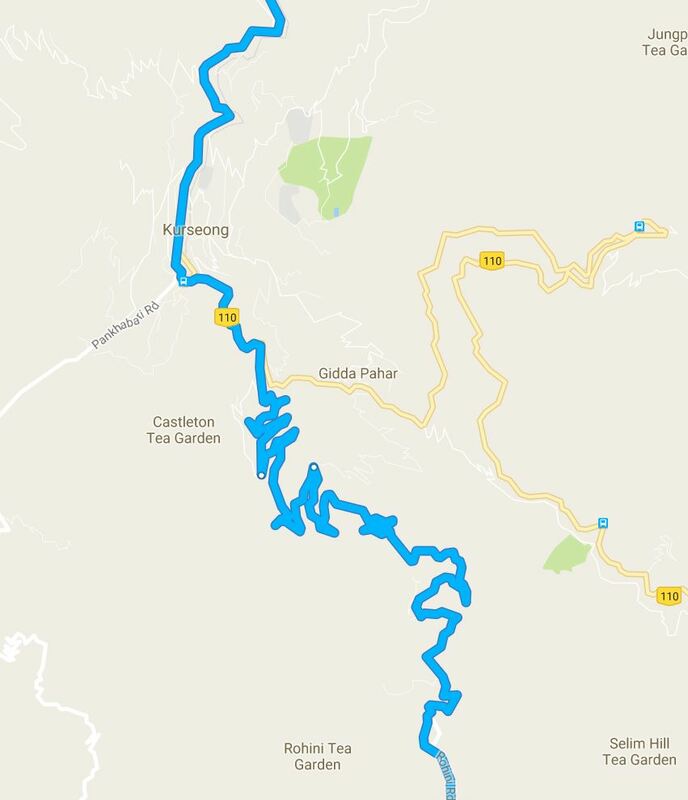 Here’s a map view of the drive from Siliguri to Sonada. Needless to say, my stomach got a little queasy at times. Leaving Siliguri, it was hot, dusty, and miserable. About half an hour into the drive, we started climbing up a mountain, and the air started changing. It got cooler and cleaner (or so it felt), and I felt like a new person. The drive took about 2-1/2 hours, including a lunch stop along the way. We got vegetable momos (dumplings), and I was in heaven because momos are quite possibly my favorite food here. We finally made it to Sonada, and all I wanted to do was go to sleep. I don’t understand why travelling is so tiring when all you’re doing is sitting for hours and hours! The plan for dinner was chicken momos (yes, we did just have momos for lunch, but those were COMPLETELY different… vegetable vs. chicken… duh), and I was determined to learn how to make them. I’ve been trying to force my way into the kitchen this entire trip because I want to learn how to make a few things for when I go home, but no one ever lets me help with anything. I refused to take no for an answer this time, and I learned how to wrap the momos! They had already made the dough and the filling by the time I got there, so that will have to be a lesson for another day. The first one I wrapped looked horrible, and everyone (myself included) spent a solid 5 minutes laughing at it. I watched Anisha’s sister make about three more before I was convinced that I understood the technique, and from there, mine got better and better! By the end, Anisha’s sister said that mine were better than hers! Which, of course, I protested against, but I will say that I made vast improvements. Of course, each one took me about 1 minute to make while hers took maybe 15 seconds, but you have to start somewhere! Tomorrow we’re going into Darjeeling, and I’m excited for more mountain views! The views were amazing on the drive up to here, and Darjeeling is even higher in the mountains. You can see the road zig-zagging up the mountain. I saw a lot of people carrying very heavy looking things this way. There’s a strap wrapped around the bundle, and then you wrap that around your head. This guy had one of the most impressive loads. I tried to creep on the boxes as he walked past to see if they listed a weight, and I’m pretty sure one of them said 43kg. If that’s right and those boxes weren’t refilled with something else, that means he’s carrying about a 660-pound load! Since Sonada is built on the side of the mountain, most of the town isn’t accessible to vehicles. There’s the one main road that we came on from Siliguri and that leads to Darjeeling, and the rest of the paths are more like this (or are made of rocks). Definitely not handicap accessible!